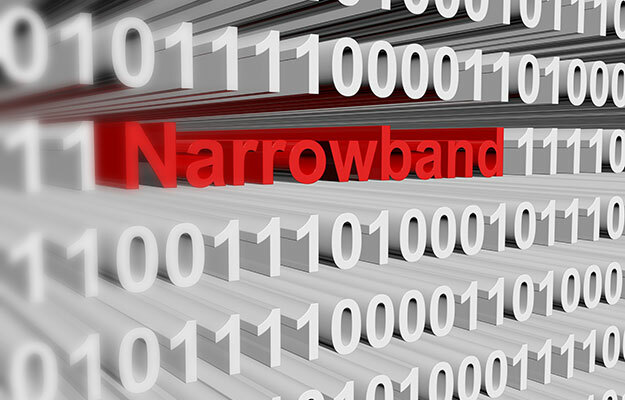 Narrowband IoT (NB-IoT) is a category of low power wide area networks (LPWA) designed to support the deployment of Internet of Things (IOT) devices. The specification was developed by the Third Generation Partnership Project (3GPP), consisting of seven telecommunications standard organizational partners. The open standard is based on that of Long-Term Evolution (LTE), designed to offer 20dB coverage improvement over GSM using 200 kHz of bandwidth per channel. This offers large area coverage for devices underground (e.g. within manholes) or deep within building structures (e.g. smart meters). Increased network power efficiency allows devices with low bandwidth requirements to run on battery power for more than 10 years. With reduced component count and battery capacity requirements device costs can be reduced to a few dollars. NB-IoT uses current 3G & 4G licensed spectrum bands with the associated interference immunity, faster data throughput (up to 200kbps uplink) due to no restrictions on transmission durations, inherited LTE authentication and encryption for data traffic. The majority of radio access networks (base stations) only require a software upgrade to enable NB-IoT, the remaining minor hardware modifications. Typically each cell can handle 50k connections. Market competition includes the LoRa and Sigfox networks which have reduced coverage and data rate specifications. NB-IoT also complements LTE CAT M1 (LTE-M), which caters for up to five times higher downlink rates. Mobile Network Operators (MNOs) are now actively engaging in trialling and rolling out NB-IoT in the USA, Europe and especially China who is leading the way with strong government support, targeting continuous coverage to areas at town level by the end of 2018. China Mobile Communications Corporation has stated revenues were substantially up in the first six months of 2018 compared with 2017 over the same period. T-Mobile is the first MNO to launch a nationwide NB-IoT service in the USA this year. Verizon already has LTE CAT M1 operational and has committed to building its nationwide NB-IoT network with testing currently in progress. AT&T is to launch its network in early 2019, following LTE-M, which was launched in 2017. Vodafone and Ericsson are trialling in the UK with the first Vodafone network already launched in Scotland with a target of all sites enabled by 2020, when there will be a predicted 14 billion devices connected as indicated by the International Energy Agency. CNIguard is embracing NB-IoT by incorporating the technology into future sensoring products, including Generation 3 of the MANITOR manhole monitoring system, designated Sentir SX3.0.